The hardest part of my job as a mom/teacher/wife/house manager is keeping up with household chores. I know they are necessary, but in my heart they aren't nearly as important (or fun!) as the relationship and educational stuff. The cleaning and ordering of a house with three kids just goes on forever which makes me even less motivated to be a slave to the to-do list. So, chores. Not my strong suit. 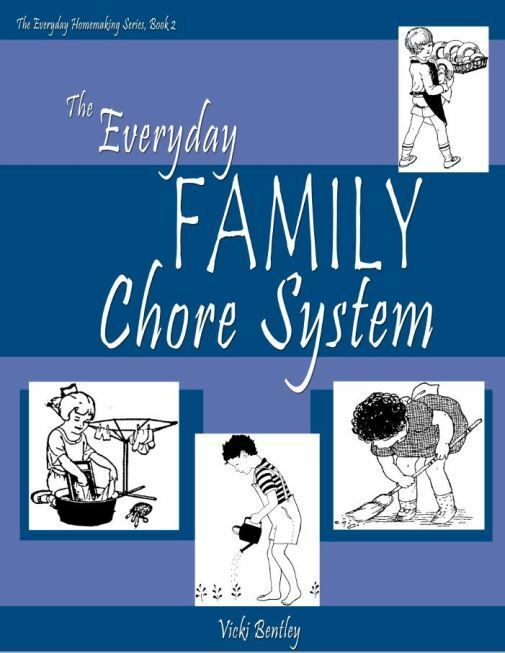 My latest product to review, The Everyday Family Chore System from Everyday Homemaking, is something I needed to review. My kids are good helpers, but they certainly weren't better than the (mediocre) example I set for them. After the race car was born, I have had a lot to recover from and needed a lot of help to do it. This short ebook really set me straight on my goals for household management and the tools to get there! Part One, Laying a Foundation, discusses child training in general and how important it is to everyone's success. Part Two, Implementing the Plan, breaks down how you go about teaching skills and motivating attitudes. Part Three, The Actual Chore System, is filled with printable cards and a discussion of how the system can work for you. The author, Vicki Bentley, begins by sharing a story about when she had to leave her husband and children at home for several days while she cared for a sick parent. Most of us would expect things to fall apart pretty quickly and come home to a mess, but her kids had been trained so well in the daily tasks of caring for a household that they simply continued on as normal. The oldest sibling knew very well what mom would expect and she guided in her absence. When I read that all I could think of was "I want that!" My children are 6, 4 and 4 months old. As I continued reading, I grew in confidence that it wasn't too late for this ship to change directions! Teaching kids to do a job and do it well is sometimes so overwhelming and seems much easier to just do it yourself. What this book highlights is the goal of producing an adult who is proficient in household skills AND working myself out of a job as a mother/teacher. To that end, there are age appropriate jobs, a box full of How-to-do-it cards, zone approaches, and a few different ways of assigning jobs. There isn't one hard and fast way of doing it, but several options suggested depending on your household needs. We have begun implementing the card box and job assignments in conjunction with the new school year beginning. The methods are very useful and versatile. The availability of all the printables pushed me further into organization than I would naturally go. As with most things, anything new is exciting and motivating to J, at least for a while. He has certainly thrived with more responsibility the last few weeks and that makes me hopeful for more success down the road. However, as good as all these things are, the greatest impact from this book originated from the beginning discussions about the heart of the matter. One of our main purposes in homeschooling is guide our children intentionally so that their hearts and minds are equipped to serve God and serve others with success, self-discipline and joy. 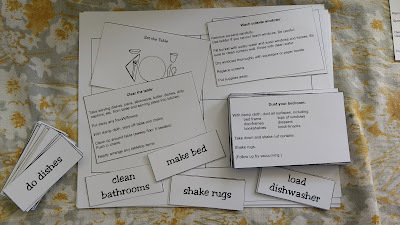 This Everyday Family Chore System is a way to keep their hearts focused on Him instead of getting burdened down with tasks that will be necessary their entire life. How many fights in your house result from someone dragging their feet or all out refusal to complete a task? Too many in our household I'm afraid. I'm happy to say we're working on changing that! If you would like to get this handy book or one of the other books Everyday Homemaking offers, my readers can get 10% off until September 5th using the code TOS10books.